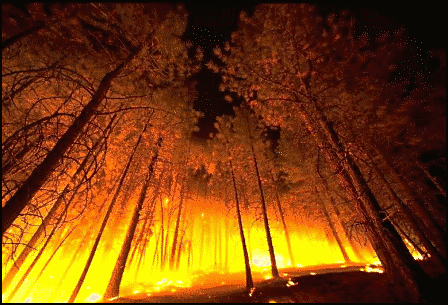 “Prescribed Fire” is a technique used in forestry to promote the health of the eco-system; it cleans up forest floor debris and old growth, and triggers new growth, which is suitable for animal habitat. Imitation is the highest form of flattery, and when done correctly, nature repays the compliment with new healthy growth. This deliberate intervention is also a good way to prevent the large, out-of-control blazes, such as those suffered in British Columbia a few summers ago. When fire is continuously suppressed, the life cycle of the forest is interrupted and begins to spiral towards disaster. Nature will always find a way to restore balance, no matter what degree of sacrifice and destruction is required. This same logic is also true for our own health – inflammation has a positive purpose for our health and development. Fever, for example, is not only a powerful part of our immune response, but it is also a trigger for the stages of childhood development. It has been widely observed that a child will go through a growth spurt after resolving a childhood illness, such as measles or chicken pox. If fever is suppressed with drugs or herbs, then the toxins and microbes are stored in the cells, rather than burned off. Also, a lack of fevers in childhood sets the stage for cancer later in life, as the unexpressed energy of the fever needs to manifest in another form. Nature balances the equation here as well. The question of what to do for a child in the face of infection and fever puts many parents into a dilemma. On the one hand, the impulse to protect the child from the assumed dangers of fever is unfortunately translated into a suppressive medical approach, which takes its toll on long-term health. Oh the other hand, sitting back and doing nothing can also raise a great deal of anxiety – letting nature take its course may be a risk in certain cases. So the question shouldn’t be to intervene or not, but how to do so in accordance with nature and without risking unnecessary damage. Like the forestry example above, Homeopathy imitates nature, and “fights fire with fire”, with speedy results, and no side-effects. Childhood fevers can be safely and easily treated with homeopathic remedies, which act to resolve the fever process more quickly, rather than suppress it. The Law of Similars, or “like cures like”, means that the correct homeopathic remedy will move the fever forward in the direction it is already going, rather than stall it. The result is a quicker resolution of the fever, with less pain and suffering, and without the toxic by-products of the fever being stored in the cellular memory. A number of parents are also choosing to use equivalent Homeopathic remedies in place of the standard vaccine program. Fever is only one example of a healthy life function that can be suppressed. Certain physical traumas and emotional shocks can also create a blockage in the life force. These become the kindling which eventually ignites the latent diseases that have been passed down through the family tree, such as cancer and heart disease, which first start to manifest in “minor” symptoms, such as migraines, or chronic infections. By systematically removing these blockages, any symptoms or tendency towards illness will no longer find anywhere to root, and the life force will be able to function in full radiant health. In the case of a fever in a child or adult would it be safe to use Belladonna rather then using Tylenol for fever? Hi Micheline – yes, Tylenol is suppressive, and will usually be the inferior choice for treating a fever. Homeopathics are generally safe, but you also need to choose the correct remedy on a case-by-case basis — not all fevers, for example, are “belladonna” fevers, and so giving the wrong remedy will have no effect.